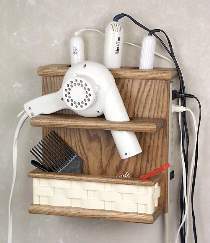 This bathroom holder organizes your hair dryer, curling irons, combs, brushes and other accessories. The woven basket design can be cut from three quarter pine on your scroll saw. A multi-outlet power strip can be added to either side. Measures 12"H x 11-3/4"W x 6-3/4"D. Paint and stain as shown, or to match your bathroom colors.